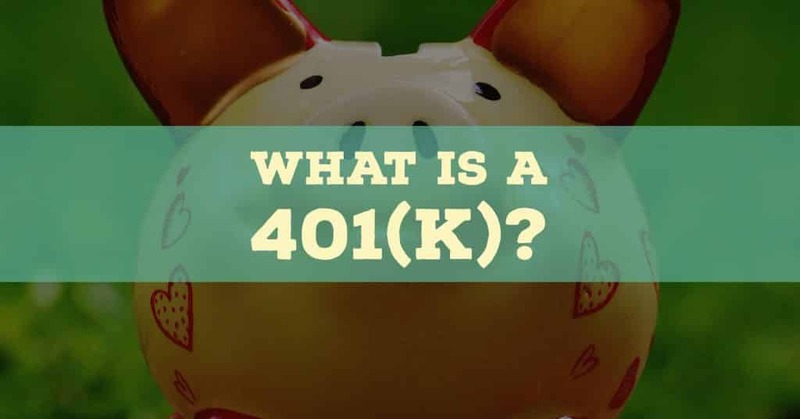 Home › Investing › What is a 401(k)? A 401(k) is an employer sponsored retirement plan that gives employees tax breaks on invested savings. Automatic deductions are taken from your paycheck and contributed to your 401(k) retirement account where they can grow tax-deferred until distributions are taken in retirement years. You are eligible to withdraw funds above age 59.5 and are required by the IRS to take distributions above age 70.5 if you haven’t already taken any before then. The best part of a 401(k) plan is that the amount you contribute to your individual retirement account is often matched by your employer in part or in full; yes, it’s free money so take advantage! Some employers will match each dollar you invest while others will match some fraction of each dollar. The types of 401(k) plans available include traditional 401(k) retirement plans and Roth 401(k) retirement plans. The difference between them is a traditional 401(k) plan offers tax breaks when money is contributed while a Roth 401(k) plan offers tax breaks when money is withdrawn in retirement years. When Does Uncle Sam Get Paid? Roth 401(k): How To Avoid Mandatory IRS Withdrawals? How Do I Calculate How Much I Need For Retirement? Contributions to a 401(k) retirement plan are made with pre-tax dollars, which boosts the amount of savings you begin with compared to an after-tax investment or savings account and compounds earnings over time to amplify the size of your nest-egg upon retirement. In a traditional 401(k), contributions are made before taxes are applied, which allows you to save more money than would otherwise be possible. The catch is that while pre-tax contributions can grow tax-free up until your retirement years, taxes must be paid when distributions are then made. By choosing a traditional 401(k), you don’t need to earn as much to invest an equivalent amount as you would if you were investing after-tax dollars. For example, if you were looking to save $500 per month you might ordinarily have to earn say $750 per month because Uncle Sam takes $250. But with a 401(k) plan you get to save the full $750 and invest that higher amount for years or even decades until withdrawals are mandated at age 70.5. Contributions to a traditional 401(k) retirement plan reduce your taxable income because they are shielded from tax until distributions are made. When you contribute to a traditional 401(k) retirement plan, you lower your taxable income for the year. The amount you contribute to your 401(k) is shielded from tax, at least until retirement. Take for example an employee earning an annual salary of $100,000. Ordinarily, the employee would be taxed on the full $100,000. But if the employee contributes $10,000 to a traditional 401(k) plan, then that $10,000 is shielded from tax, and so the employee’s taxable income is just $90,000. A maximum annual contribution of $18,000 is permitted for individuals unless over the age of 50 in which case the threshold increases to $23,000. When your 401(k) nest-egg grows, you do not pay taxes each year on earnings. Instead, your earnings, dividends and interest on savings grow tax-free until you begin withdrawing funds. For traditional 401(k) and Roth 401(k) accounts, the tax shield surrounding contributions remains in effect until withdrawals are taken. For example, if you contribute $10,000 into your 401(k) account in the first year, and it grows each year by $1,000, you do not pay taxes on the $1,000 earnings each year; in fact, you don’t pay taxes on the sum of all your earnings until you start taking withdrawals. The downside of investing in a 401(k) is that most plans have limited investment options. You cannot simply pick a favorite stock, mutual fund or exchange-traded fund and allocate your savings to it; you are restricted to investing only in the investment options offered by your plan. Fees can also be hefty in 401(k) retirement plans. Each fund in in which you invest has an expense ratio, a charge levied to manage and operate the fund. These expenses are taken at the fund level so it is not initially evident that they detract from your returns, but they do lower your long term returns. Contributions grow tax-deferred up until age 59.5, when penalty-free distributions can be made; distributions made before then are subject to a 10% penalty. If no withdrawals have been made by age 70.5, the IRS mandates that you take a minimum withdrawal amount, which ensures they get paid. A 401(k) plan allows you defer taxes to some point in the future. You are eligible to withdraw funds starting at age 59.5; withdrawing funds before then results in a penalty of 10% on funds withdrawn. If you have not taken any distributions by the calendar year you turn 70.5, the IRS mandates that you begin taking distributions, and charges income taxes on contributions and investment growth that hitherto had accumulated tax deferred. A Roth 401(k) enjoys the same tax shield on investments as a traditional 401(k) while the investments are in your account. The difference is that you contribute pre-tax dollars to a traditional 401(k), which upon retirement has a minimum mandatory withdrawal requirement, and after-tax dollars to a Roth 401(k), which has no such requirement. A Roth 401(k) allows you to withdraw funds without paying any taxes, and still you get to enjoy tax-deferred growth of your contributions up until the time distributions are taken. So what’s the catch? The IRS gets paid one way or the other, and in the case of a Roth 401(k), the government gets paid upfront when you first make contributions. Instead of contributing pre-tax dollars as you would to a traditional 401(k), you contribute after-tax dollars to a Roth 401(k). In both cases, the tax shield on investments applies when they are in your account. If a traditional or Roth 401(k) is not available to you, consider a traditional or Roth IRA account, which also facilitates tax-deferred growth up until retirement. To calculate how much you need for retirement, consider connecting your accounts to Betterment or Personal Capital, both of which offer free tools to assist you. Betterment has a great retirement calculator called RetireGuide that helps you to figure out how much you need for retirement. You can connect third-party accounts, including your 401(k) account, to analyze fees. Another option is to download a free mobile app from Personal Capital that lets you connect your bank and investment accounts to track savings, spending, investments and net worth.